This Bridgeport manufacturer helps you look the part. One of Chicago’s most intriguing small businesses is located in two apartments on a residential street in the city’s Bridgeport neighborhood. The furry subculture has been around since the early 1990s, and it&apos;s popular. Midwest Furfest, held annually in the Chicago suburb of Rosemont, claims it had over 10,000 attendees last year. Lemonbrat’s suits retail for up to $5,000. The company’s team of 16 tailors, designers and molders churn out 20 to 30 suits a month – they say they’re one of the largest fursuit makers in the country. WBEZ documented Lemonbrat’s fursuit-making process in the photos below. Head Furrer and Pattern Maker Avery Ritter works on a fursuit head. Lemonbrat often installs tiny fans in the finished heads to keep their wearers’ cool. To get the fit just right, Lemonbrat has it&apos;s fursuit customers wear a painters’ suit and cover themselves in duct tape. They then peel off the duct tape and ship it to lemonbrat, which restuffs it to get an exact model of the customer’s body. Lemonbrat workers pour foam into a mold for a fursuit head. Once the foam hardens they’ll wait 45 minutes, pull out the foam off the silicone base, and let it sit for a few days before sanding it and cutting out details. 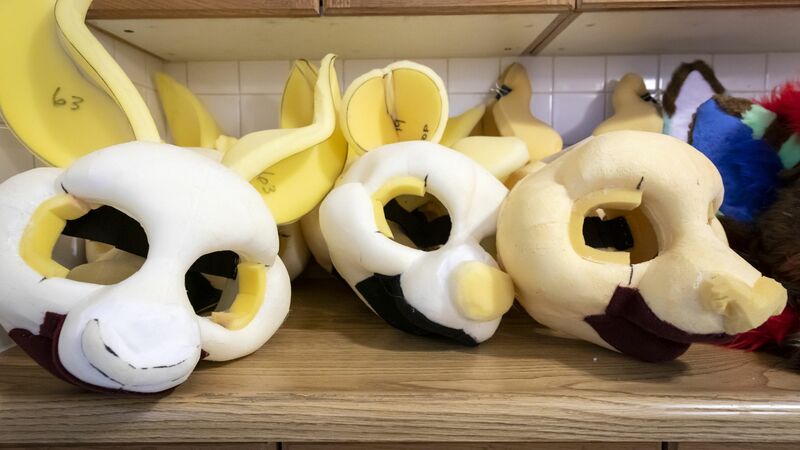 Lemonbrat produces nearly 200 suits a year, making it one of the lagest fursuit makers in the country. Every few weeks a group of Chicago-area furries gather at a local bowling alley to socialize. The Midwest Furbowl brings in an average of 70 people, twice a month at Polar Creek Bowl Lanes.